Although it seems that this winter will never end, it will. Soon, I hope. Before that happens I want to cover one of our very long distance migratory birds, the Swainson's Hawk. This hawk nests as far north as our area and travels south all the way to central Argentina for the winter where it spends about three weeks before starting the long journey back. As mentioned last week the Swainson's Hawk is one of a trio of large hawks that can be found in our area. 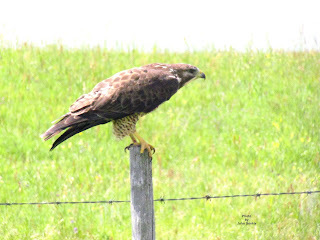 Unlike the Red Tailed and Northern Harrier the Swainson's is more a hawk of the plains but not exclusively as is the Ferruginous Hawk . It is quite similar to the Red Tailed and is often confused with it but there are differences that can be quite easily utilized in the field. First, if seen from above or from behind the Red Tailed has a rusty tail the Swainson's does not. Second, The Red Tailed has a black chin while the Swainson's has a white one. Third, the Red Tailed has a broad dark breast band while the Swainson's has a dark chocolate upper breast but no band. Fourth, when in flight and viewed from below the Red Tailed has dark leading wing feathers while the Swainson's has dark trailing wing feathers. (see a good bird book for a better idea of the differences). When perched or in flight to me the Red Tailed has a light breast with black chin while the Swainson's looks as if it were dipped in chocolate head first up to its belly leaving the front half of the bird dark except for the white chin. The Swainson's is a relatively weak hawk feeding on small mammals and large insects like grasshoppers. This food preference for insects almost wiped the species out several decades ago. What happened is that one of the agricultural insecticides was banned in North America because it did not break down after use but stayed intact on the insects that it had killed. The manufacturers disposed of their stock by selling it at a deep discount to farmers in South America where it was used extensively. As the Swainson's Hawks migrated south they fed on the dead and dying poisoned insects thereby poisoning themselves. The result was a massive kill-off of hawks numbering in the tens of thousands. A number of wildlife organizations saved the hawks by having the poisons banned world wide. The good news is that the Swainson's Hawk population , though severely decimated, is slowly making a comeback. This week's picture was taken alongside a dirt road near Coronach, SK. in the Big Muddy Valley. I was not able to get a frontal view of the hawk but the white chin is visible as is the dark breast - although barely. After being in Calgary for a week I had hoped to return home to nicer spring-like weather. Not so. However, on our way home we took a break in Medicine Hat and the temperature there was 16C. Nice. It was just east of there that we saw our first Red Tailed Hawk of the season but with the amount of snow that we have here it will still be awhile before one is seen locally. The Red Tailed is the most common and widespread hawk in all of North America including much of Mexico. In Canada it is found everywhere as a summer resident except on the Tundra. It is not highly migratory leaving most of Canada for the central US in the winter. In most of the US and Mexico it is a year round resident migrating south from the north central states and a north from southern Mexico. 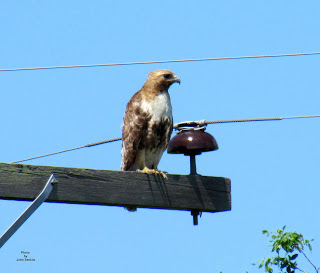 The Red Tailed Hawk is a powerful bird that can take prey the size of a half grown skunk or rabbit but prefers the ubiquitous Richardson's Ground Squirrel (gopher). I have actually seen them take both rabbits and gophers. It is quite an experience. Once a hawk zeroes in on a small animal caught out in the open lunch quickly follows. Escape is difficult. Save for the eagles the Red Tailed along with the Swainson's and Northern Harrier (formerly, Marsh Hawk) is one of the largest hawks in our area. Because the Red Tailed is spread out over such a large area it is only natural that there would be considerable colour variations. In fact the Red Tailed varies from very light to very dark and with everything in between. Formerly the pale race was known as a distinct species called Krider's Hawk and the dark race was known as Harlan's Hawk and the two races are still referred to as such. However, the most common form is a brownish bird with light under parts sporting a dark spotted breast band. Except for the Kriders and Harlans forms (and juveniles) all Red Tailed Hawks have rusty red tails when viewed from the top. Males and females are the same. It should be noted that the Swainson's Hawk also has light and commonly dark colour phases so care must be exercised when identifying dark and light hawks. Locally, a large hawk sitting on a power pole is probably the Red Tailed. Red Tails nest in trees and preferably in tall mature Aspens near water. The nest is a large ungainly affair made of sticks built at least five metres high and is usually reused from year to year. Occasionally Great Horned Owls will take a nest for themselves forcing the hawks to build a new one elsewhere. Between one to three young are usually reared annually. This week's picture was taken two years ago near Coronach, SK. where there were plenty of gophers and a corresponding number of hawks to prey on them. The dark breast band is clearly visible. Finally, I have had two further reports of Boreal Owls in town. One apparently spent most of the winter in one particular yard right in town; the other was found dead in a garage. I do not know if this represents three different birds or only one very friendly bird flying around visiting different yards. I hope it is the former because I hate to think that the dead one was the only one.